A serene poolside edifice resembles a giant mirrored bird cage in the heart of Lafourche. Custom built to withstand hurricane winds|! !| this seemingly fragile glass-enclosed orangery was expanded from its original size into a sturdy structure that adheres to the Florida Building Code with deep pilings|! !| additional steel interior beams and haze free|! !| impact-resistant tapered glass. A circular peacock emblem was installed in the travertine flooring to exemplify the peafowl theme. On a sizzling hot morning, I took a drive under clear blue skies, traveling along Highway 90 toward Raceland to see Kelly and Nicole Falgout’s latest pride and joy: their newly constructed, extraordinary pool house that was built from a Victorian-inspired French orangery. I had been hearing about this “glass outdoor living room” for months from various family members who were instrumental in its concept, design and sourcing from abroad. So I finally decided to bite the bait. “You’ve got to see this, it’ really beautiful,” said my daughter Simonette, a decorative painter and sculptor who faux-finished the arched ceiling to resemble weathered copper with the assistance of sculptor Dave Whatley. I have to admit, at first glance, I was taken in with all the stories about its evolution and by its unique design and construct that transcends the typical orangery/plant-filled conservatory. The Falgouts’ discovery of a lone, hand-painted tile depicting a peacock was the genesis for the building’s evolution and eventual interior decor. Nicole took the lead, got rid of the interior decorator and devised a theme per the inspirational peacock plumes. The fanciful peacock tile, discovered while shopping for antiques, is now demurely positioned as the centerpiece of the kitchen’s backsplash. Various features of the pool house, from statuary and tea cups to the color selected for the cast-iron exterior beams, were inspired by the vibrant shades of aqua plumage from the bird’s tail feathers that can change color with the angle of incident light. The effect of pale, sea-foam hues beneath an ethereal skylight inside a glass house is at once soothing to the soul. A pair of identical putti resting on ornamental scrolls embellishes the symmetry of a walkway strewn with Italian cypress that leads from a stately courtyard down to the pool area, Italian-inspired gardens and fountain. The new building, situated near a shallow pool “designed for the children,” (yet embellished with statuary from the Vanderbilt estate) adds to the overall allure of the grounds and bucolic setting. It’s the ideal party house near the bayou, complete with travertine flooring, a gourmet kitchen with marble counters, a full bath, combination living /dining room area, unobstructed panoramic views and a skylight-atrium that seems to ascend to the heavens on a clear day. “We can sit in here and watch the children in the pool, and it’s great for parties,” says Nicole. A similar, serendipitous mindset prevailed during the design of the Falgouts’ adjacent main house. After acquiring antiques through the years at auctions and shows, the Falgouts decided to design various rooms to accommodate their most prized pieces, such as the old Victrola in the foyer that doubles as a planter, a claw-foot Victorian sofa and the circa-1800 fireplace settee nestled in an alcove. “We designed our living room around that piece,” she says. As we walk throughout the 4,200-square-foot, two-story hous, Kelly points out items they have stumbled upon during their travels.“We get great deals at all these auctions," he says. A contagious enthusiasm prevails among these natural raconteurs once we set foot in the pool house, where all the best times, from nap times to party times, happen within the contiguous walls of glass and mirrored exterior. You can look out, but you can’t look in. While building their new residence in 2008, Kelly and Nicole lived in the modest 1,500-square-foot house that came with the 45-acre property punctuated with commanding live oaks and the occasional local critter (I see a small alligator during our bumpy golf cart ride to the property’s border). Now, with three young children under age 6, their home has become utterly kid-friendly and durable. In fact, it was built to withstand “just about anything,” including major hurricanes. “We built the main house in adherence with the strict Florida hurricane building code. This included all the windows, which do not need shutters due to their strength,” explains Kelly. He also made similar specifications when it came to the customized pool house. “The glass can withstand 135-mile-an-hour winds,” he adds. “We used reflective glass on the exterior of the pool house to deflect the sun’s rays, and for that mirrored effect. We also laid a slab and added extra steel beams to fortify the center of the building, to make it stronger. It was all custom-built, and then shipped here from overseas.” Hardy board siding made of durable fiber cement was inserted between some of the glass panes to add further protection against strong winds. The pool house provides a splendid 360-degree view of the 45-acre property, which includes the pool area, rows of ancient oaks and a narrow levee rimmed by ponds and wildlife. The cleverly designed orangery-turned glass pool house was purchased through French Fountains/A Division of French Casting Company, when the couple visited New Orleans. “It’s actually larger than the one we ordered because of our additions,” Kelly says. 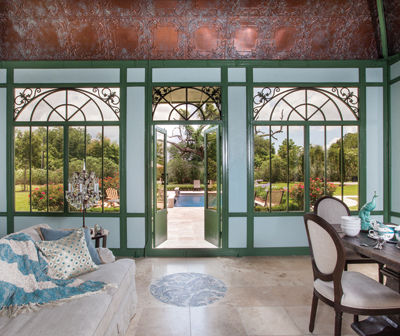 “The Falgouts’ cast-iron pool house was fashioned from a 19th-century French l’orangerie of Victorian design, with arched transoms, an atrium and French doors,” says Michelle LeBlanc Fine, owner of French Fountains and its eponymous casting division. A garden element designer, Fine also furnished various fountains, urns, antique benches and statuary around the grounds, including the Vanderbilt piece near the pool and consoles from Lyon that were transformed into kitchen islands and such. “The 19th-century cast Italian marble fountain that serves as the centerpiece of the pool was originally installed in one of the Vanderbilt mansions of Newport, Rhode Island,” she says. Many imitations have followed since the inception of the first (circa 1617) orangery in Paris, including Europe’s largest, designed for Louis XIV’s 3,000 orange trees at Versailles. More than just a greenhouse, an orangery was a status symbol among wealthy 17th- and 18th-century aristocrats. These structures were eventually overshadowed with the development of the modern greenhouse in the 1840s, thanks to the ingenious glass architecture of Joseph Paxton, whose 1851 Crystal Palace glass house at Chatsworth was nothing short of monumental. The genre continues to evolve. Case in point: A glass house in Raceland where you can actually ride out a major hurricane.